The conscious vs. the unconscious. Like two famous show characters, from the most famous show of all: life. A tête-à-tête recounted as never before. A brisk, startling and cheeky, reveal-all (and then some) exchange between two entities that have been dealt the greatest of responsibilities: making up their mind. Whether to talk or be silent, whether to love or hate, fight or flee. Locked in a no-holds-barred battle of wits, Oscar and Felix are the spokesmen of the Conscious and the Unconscious occupying George Martini. The upshot is the story of a life, which in turn is a metaphor of millions of other lives, even our own. A unique style for a great read that flows before our eyes like a film. The pyschic processes in the unconscious are not entirely identical with those known to us from our conscious psychic life, but have the benefit of certain notable liberties of which the latter are deprived. According to recent investigations, the unconscious is a sort of cognitive ghetto - a home for homeless thoughts. Alas, many thoughts are now home-sick. If the conscious mind desires a goal the subconscious mind disagrees with, guess which mind usually wins the contest! "System 1" and "System 2"... the unconscious and the conscious... as a psychodrama with two characters. Jokingly, we can say everything, even the truth. Conscious vs. Unconscious. Seen as two celebrated performers. Of the most celebrated of the shows: that of life. A face-to-face tale never told before. Marco Tullio Barboni was born in Rome where he lives and works. Scriptwriter and director, he represents the third generation of a family working "in the flicks," after his Uncle Leonida, Anna Magnani's favorite director of photography, Anna Magnani, and his father Enzo, creator, under the pseudonym E.B. Clucher, of the Terence Hill and Bud Spencer sagas. After a brief experience as assistant director, Marco Tullio attains a degree with honors in Political Science at "La Sapienza" University of Rome, where, after discussing his thesis on cinema censorship with supervisor Prof. Aldo Moro, he begins his professional activity as writer for cinema and TV. After more than fifty projects, including films, shorts and TV movies, "...and you will call it fate" represents his debut in the publishing world. Legend would have it that Sigmund Freud, father of psychoanalysis was terribly envious of his fellow citizen and contemporary Arthur Schnitzler, he too a physician, but more famous as a playwright and novelist, and that he had always refused to meet him. The cause of this envy, by admission of the selfsame Freud, was the fact that Schnitzler's stories and novels were more fascinating than his clinical cases and that Schnitzler's made-up characters were "truer" than his flesh and blood patients. I too, as a psychiatrist, am prey to an invincible envy towards one, who though a layman, can masterfully penetrate the human soul and describe its meanderings. Alas, I must admit that yet again I have felt the twinge of envy reading the work of MarcoTullio Barboni "... and you will call it fate" who, with his writing has managed to conjugate and combine two particularly complex themes very dear to me, those of the unconscious and destiny. The unconscious and destiny which, as Karl Gustav Jung said, are perhaps one and the same thing, depending on one's perspective. We must give credit to the Author and his brilliant literary effort for having created this admirable synthesis. 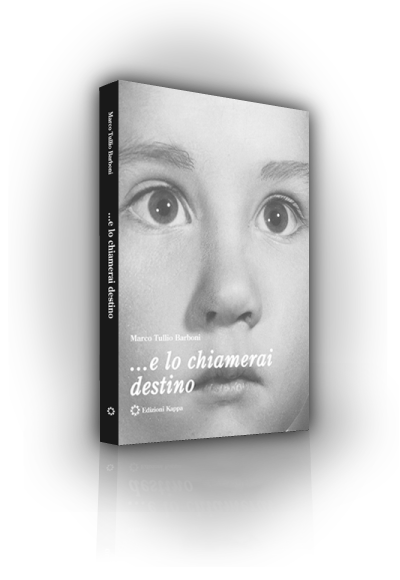 Marco Tullio's cogent and well-structured work analyzes with erudition and depth, aspects and mechanisms of life that influence the destiny of every human being, capable of sentiments and emotions, qualities increasingly rare these days. The author's interesting approach also led me to reflect upon my personal experiences and to analyze, now that I have the age and time to do so, the sequences of my existence which have been studded with such a variety and number of serendipitous events, the logic of which has always escaped me. Especially regarding the impossibility of solving the age-old dilemma: is a human being capable of determining his destiny or despite ourselves are we unwitting actors of a pre-written plan? As of centuries, great philosophers and thinkers have pondered the question and a reading of "...and you will call it fate" will surely be a help in solving the enigma. - August 2018. Earns two mentions in the context of the SALVATORE QUASIMODO INTERNATIONAL AWARDS: one for the book and one for the theatrical adaptation of the same. - September 2018. Awarded the Premio Letterario Montefiore - within the open-theme section for Narratives, Poetry or Essays written in vernacular Italian or a foreign language . Receives the first place award ex aequo with another illustrious protagonist, the Italian journalist and essayist Andrea Scanzi, author of "Renzusconi."